Ultra 510 Desk Mount | ICWUSA.com Inc.
Popular in healthcare and dental settings, the Ultra 510 Desk Mount allows the monitor and keyboard to move together and adjust separately. It’s a rigid, non-sagging arm with smooth movement through its entire range of motion. With the Ultra 510 Desk Mount, your monitor and keyboard can be positioned exactly where you need them, then stowed out of the way when not in use. This modular arm has an extensive number of combination choices, so you can configure it to precisely fit your requirements. The Ultra 510 computer mount is available in desk, wall, wall track, and pole mount options, and can be configured with a laptop tray. 37.5″ (95.3 cm) with monitor and keyboard. The Ultra 510 Desk Mount has long reach, stability, and smooth articulation. The mount is a rigid, articulating arm that stows in a minimum amount of space. 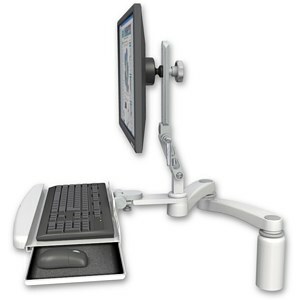 This arm can be configured with a monitor only, or a monitor and our standard keyboard tray. The arm mounts to a wall, wall track, desk, or pole, and can be configured with a laptop. The Ultra 510 Desk Mount is machined out of aircraft quality aluminum for strength and durability. The Ultra 510 Desk Mount’s horizontal adjustment range is 22.5″ (57 cm) with monitor only, and 37.5″ (95.3 cm) with monitor and keyboard. The monitor is supported by two articulating joints that each provide 90° of tilt adjustment and can be locked securely in place. The Ultra 510 Desk Mount extends horizontally, rotates up to 360° at the mount and swivels 360° at the extension arm joint for complete control of workstation position. The Ultra 510 Desk Mount supports up to 18 lbs (8.2 kg).